Gen. Dempsey Disputes Gates' Characterization Of Obama : The Two-Way In an interview with NPR, Gen. Martin Dempsey, the nation's top military officer, said he never questioned that Obama "trusted me." In his controversial book, former Defense Secretary Robert Gates said Obama felt the military was trying to box him into decisions. 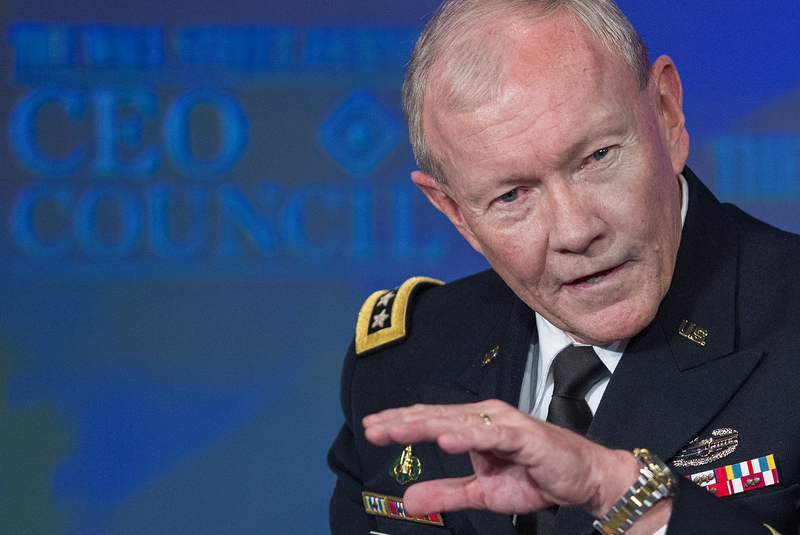 Gen. Martin E. Dempsey, Chairman of Joint Chiefs of Staff, in November of 2013. The nation's top military officer, Gen. Martin Dempsey, is disputing former Defense Secretary Robert Gates' contention that President Obama is suspicious of senior military leaders. In an interview with NPR on Tuesday, the chairman of the Joint Chiefs of Staff says he's never picked up on those feelings from the White House. In his book, Duty, Gates says President Obama was distrustful of the military and its motives, complaining the military was trying to box him in on sending more troops to Afghanistan. Dempsey sees it differently. "I have never questioned whether the National Security staff, the president of the United States or the vice president trusted me," Dempsey said. "I always felt that they would tell me if they didn't. I can't speak for why Secretary Gates felt that way, I do not." Gates recommended Dempsey for the top military job before retiring in 2011. Dempsey says he hopes the book will spark a discussion about the relationship between military and civilian leaders. In his new memoir, Gates says that when soldiers put their lives on the line, they need to know the commander-in-chief believes in their mission. The quality Gates missed in Obama was passion. And where this passion mattered most, he wrote, was in Afghanistan. "Passion is an odd way to put it — and again, I'm not criticizing the book," Dempsey said. "I have seen emotion in the president, [he] genuinely feels the loss of service men and women. I certainly recognize in him that he feels a responsibility as commander-in-chief." Dempsey says Gates has tapped into a broader issue: that democracies have difficulty staying focused on prolonged wars.